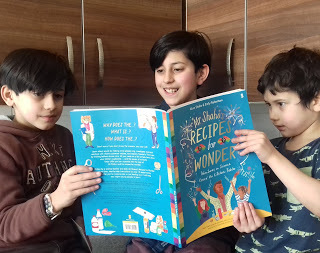 DS9, DS11 & DS6 checking out the book as soon as it came through the letterbox! It begins with an enchanting tale of Alom as a boy, who has just arrived from a Bangladeshi village and how a simple trip out with his mother to a local street market sparked an interest in science. The kiddies found this so inspiring and wanted to read on, to find out how they too, can become a scientist! 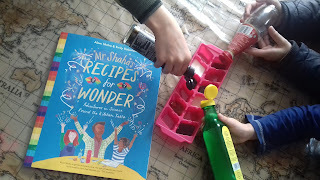 Since receiving Mr Shaha's Recipes for Wonder, the kiddies have wanted to begin their day with science! First thing each morning they make a dash for the book and find the equipment needed, many of which we had lying around the kitchen, which is great as we haven't had to buy any special equipment. 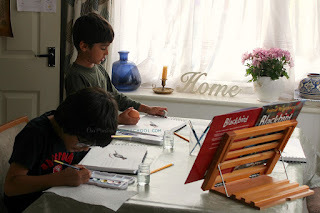 This book turns simple things you have around the kitchen into an amazing experiment! Now from experience with kitchen experiments, you never know if they are going to actually work or turn out to be a disaster!! You're left feeling deflated, with wasted ingredients and the kiddies aren't too impressed! But you can certainly use this book in your science lessons with confidence, it has been a completely different experience! All the experiments actually work, so no disappointed kids! 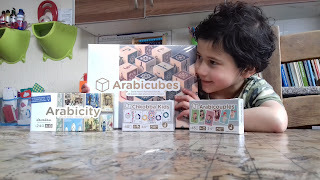 With simple step-by-step instructions, the kiddies could easily read through the text themselves, reading what Mr Shaha had to say after they had completed each task in order to fully grasp what they had learnt. 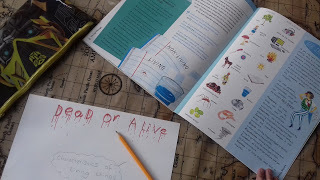 This was great as they not only carried out the experiment and explored for themselves, but they also discovered the science behind each activity and all their Why does the...? What is...? How does the...? questions were answered!!!! Another great thing about this book is that all my children can get involved and learn something new! From DD14 right down to DD3! DD3 has popped a seed in a jar to watch it germinate and will be using her artistic talents to record what happens. Their favourite experiment was 'The Balloon-Inflation Machine' which the boys thoroughly enjoyed carrying out. Watch our short clip here. For this task they began by pouring different types of household liquids into an ice cube tray. They then spooned a little bicarbonate into each compartment and observed what happened. Trying to make the test as fair as possible. 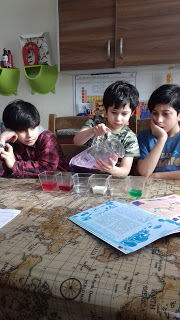 After discovering vinegar to be the liquid that bubbled the most when mixed with the bicarbonate, they then moved on to the next stage of the experiment! They filled a third of a bottle with vinegar and filled a balloon half full with bicarbonate, stretched the balloon over the bottle and released the bicarb into the bottle in an attempt to inflate the balloon! 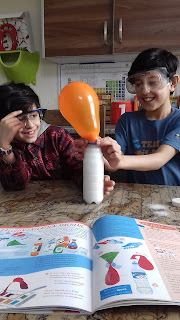 They were amazed at how fast the balloon inflated, learning all about chemical reactions and how some substances react with each other, producing Carbon Dioxide. They read Mr Shaha's explanation of what happened and then began writing up their experiment! To get your hands on a copy of this amazing, new science book, check it out here. 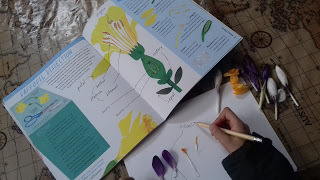 This book makes learning science fun and practical, perfect for all Home Ed classrooms! Look out on our Instagram page today for more videos which I'll be posting throughout the day!! 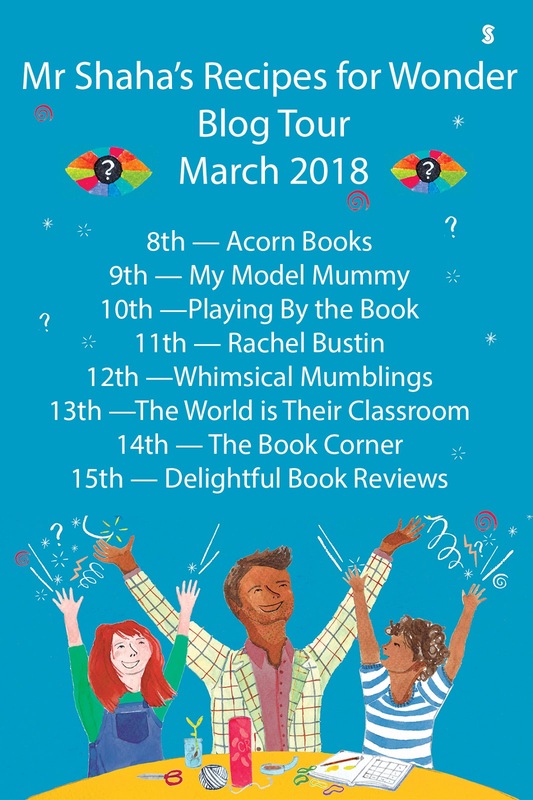 You can also check out the other amazing blogs which are on tour! Here's Alom carrying out some of the experiments from his book and you can also watch five of the experiments, from Mr Shaha's Recipes for Wonder , in this video! And finally a big Thank you to Scribble Kids Books for inviting us on this Blog Tour and sending us a copy of this book to review! Disclaimer: I was kindly sent this book to review and try out the experiments with my children. All opinions are my own and I am only recommending this particular book by this author. This post contains affiliate links.